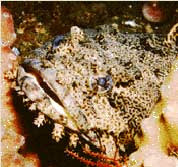 The Venomous Toad Fish or batrachoididae is found mostly in Central South America. This dangerous fish averages only 7-10" in length and is dull in color. This fish will lie buried in sand much like the Stone fish and people will step on the poisonous spines on their back. Be very aware when you are swimming or scuba diving in areas that have these type of fish.